Many people who are a dab hand in the kitchen are of the opinion that pressure cookers are passé and (secretly, laughably) temporally naff, embarrassing even. Well, I disagree. My trusted pressure cooker saved the day today, as it has done on many an occasion. When the adjective ‘slow’ is cause for inward groaning, i.e. on those occasions when timeliness and swiftness are of the essence, a pressure cooker can be a gal’s best friend. Here is my story today. What’s a poor gal to do. She knows that her boys want to watch the MotoGP Finale on TV, the one to be held in Valencia on Sunday afternoon, beginning at 2 p.m. Which is that time of day that signals a quasi atavistic pull of what goes into family-bonding lore – the Sunday lunch, ‘il pranzo della domenica’, as nostalgically spoken of in hallowed terms in Italy as is its counterpart in the United Kingdom , the famous Sunday Roast. 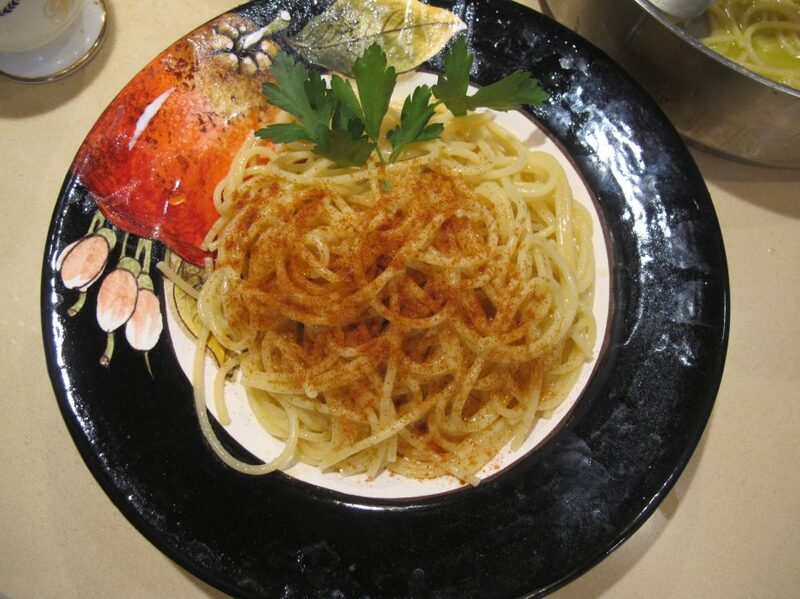 Traditionally, the pranzo della domenica is the preferred meal of older folk, because they weren’t used to eating a large meal in the evening. It heralds and permits gastronomic specialities and even excess, it revels in conversation, debate and catching up, and sometimes includes card playing and favorite TV programmes to follow, not to mention furtive or blatant siestas. Sunday declares it is not a day of work, it is a day to forget about the woes in life, it is supposed to be a day of rest and recuperation. Time slows down on a Sunday. The only hitch, truth be told, is that the traditional pranzo della domenica actually entails a lot of work and scotches the very notion of a comfy lie-in to catch up on any sleep lost from the surfeit of Saturday night’s carrying on. If you don’t mind doing all the shopping and schlepping on the Saturday, and then getting up early on the Sunday morning, to do the rest of the cooking, set the table and fiddle dee dee … then indeed it can be truly delightful. It’s not often that I cherish waking up early on a Sunday morning, however, and that is why we rarely have a proper ‘pranzo della domenica’ in our home. We are more Sunday supper kind of people. That said, a feeble essence of what should constitute a Sunday en famille has always clung to me. We owe it to ourselves to make one day in the week a little special for us. It’s a civilised thing to do. My last post was all about how I attempted to make a plain courgette risotto a little ‘special’ on a Sunday, and I probably wouldn’t have bothered to do that had I had to make the risotto on any other day of the week. Anyway, back to today. The boys announced that they were going to be gripped by a whole afternoon of live-sports TV watching – first the exciting motorcycle world championship final and then the ordinary Sunday football matches (the Roma-Lazio match being very close to the knuckle today). I don’t know much about either but I did know that Valentino Rossi is the big name in motorcycling racing, and when I innocently ventured to ask why he was not in starting the race in pole position … I got an earful of explanations that were quite beyond me. All I managed to understand was that there had been some hanky panky behaviour on the part of another motorcyclist Marc Marquez in a previous race in Malaysia and that some of the protagonists of these races were not above chicanery and trickery (Read more about it at this link: http://www.bbc.com/sport/0/motorsport/34731253). Human nature is human nature, I suppose, in whatever guise it presents itself, be it in the world of racing or in plain everyday life. Friends had invited my husband and me to a spiffing dinner last night, one that we overindulged in because every single plate and dish was just so tempting. I don’t normally go for puddings and desserts and yet even I ended up tucking into freshly made panettone by Rome’s purveyor of gastronomic goodies, Roscioli … on top of a passion fruit, chocolate and ricotta pudding, home-made chocolate and pistachio log and dessert wine both bubbly and still. All this to say that the last thing I wanted to think about this morning was … food. And yet, it’s a funny thing … people get hungry again, even after large meals – go figure! So off I trotted to the Sunday farmers’ market at Ariccia, and bought some veggies and spuds and good bread and fresh fettuccine. It was well past one o’clcok when I got home and started to get on with the lunch. Some would call me ambitious or silly or both. Me? I know I can rely on my trusty pressure cooker on occasions like today. The first thing to do is get the soffritto going… which I started off straight away in the pressure cooker. I put the water on to the boil, and added some bay leaves and another celery stick that was lurking about in the fridge. The bay leaves and the celery would add a je ne sais quoi to the cooking water … but they are not a necessary ingredient. The minced and sausage meat … Sprinkle salt over the meat, together with just a hint of nutmeg. Squeeze the tomato concentrate directly into the glass of red wine. Give it a good stir. Add a good ‘pinch’ of salt to the milk. Grate plenty of parmesan cheese. Okay, now that the soffritto got going, and I had all the ingredients to hand, I got on with the recipe. This was the time. Pour some evoo into a frying pan, and add a few peppercorns and 1 clove. Add the minced meat and cook it over a high heat. Meat cooking on the left, soffritto almost cooked on the right. When the meat has browned, Add the wine all in one go. Use the wooden fork to un-clump the meat, to loosen it as it were. Now add the passata. Stir it in. Once it has combined (in less than a minute, surely? ), switch off the heat. Transfer all of this to the pressure cooker. Combine the meat, its sauces with the soffritto. Stir well. Remember the milk? Time to add the milk. Stir. I liked the idea of adding some parsely stems. Again, stir. Secure the lid of the pressure cooker … and away we go. What’s the time? Right … The pasta water is bubbling merrily away … I decide to make some hummus while I wait. I may as well, it doesn’t take long. I can hear the boys in the other room exclaiming and groaning and commenting like crazy. Much good it will do me, don’t understand a thing about this race other than poor Valentino Rossi has been penalised. What ‘s the time now? Ten past two. The pressure cooker has been on for 20 minutes. Switch off the heat. Move the pressure cooker to another burner that is not hot. Release the steam etc and open up the lid. Now place the opened-up pressure cooker to a burner with the heat on, to simmer. While the fettuccine cook. The fettuccini take less than 5 mintues to cook. Remember the first frying pan? It’s still streaked with some of the sauce. Add a knob of butter. Fellow blogger Stefan (http://stefangourmet.com) commented on the generous portion of butter added to my risotto last week. This is to show him that it’s not just risotto that stands to benefit from butter, tee hee 🙂 ! Time to dish out! It’s nearly ready! Put some of the ragù in the frying pan. Turn the heat on. The butter will start to melt straight away, because the ragù is hot. Drain the cooked fettuccine straight into the large pan. Use a wooden spoon and a wooden fork to combine everything. Make liberal use of the pasta water when you see things drying up a bit – don’t worry about adding too much, egg pasta is notoriously greedy when it comes to pasta water, it will absorb it with gusto. Do add more ragù too … until you reach the proportion of meat sauce/fettuccine that pleases you. Add a teensy bit more on top. Shower with parmesan. And yes … I love food and I love cooking food for the people I love. Fettuccine with ragù alla bolognese … served in a lovely hand-painted ceramic plate (c/o Giardini di Sole) and served on a bog-standard IKEA plastic tray, ahem. Is there a better way of watching a race on TV? And later on … phew … the Roma team beat Lazio 2-0. Lefotvers for tomorrow … or to freeze.